This article gives you complete information about Randy Orton who is the famous wrestler in WWE. More details about the biography, Profile and championships won by Randy Orton is quoted in this article. Randy Orton is one of the famous American wrestlers who is a superstar in Smack down in WWE. Randy Orton comes from a professional wrestling family where his grand father Bob Orton, his father Cowboy Bob Orton and his uncle Barry all are professional wrestlers. 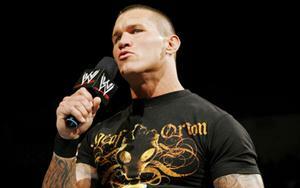 Randy Orton is known in "Legend Killer" which is his famous nick name. Randy Orton is the youngest wwe superstar to won a World Heavyweight Championship at the age of 24. Randy Orton has won World Heavyweight Championship for three times and WWE championship for six times. Randy also won a Royal rumble match in 2009. Randy Orton started his WWE wrestling career in the year 2001. In 2003, Orton was a member of Evolution with Ric flair, Batista and Triple H. Orton was married to Samantha Speno in September 21 2007 and has one daughter named Alanna Marie Orton. Finishing move of Randy Orton was named as RKO. Another move is his Running punt kick to the head of the opponent.